VOLUNTEERS are being sought to help out at the Play Days Active Kids group in Rednal, writes Lauren Tiller. 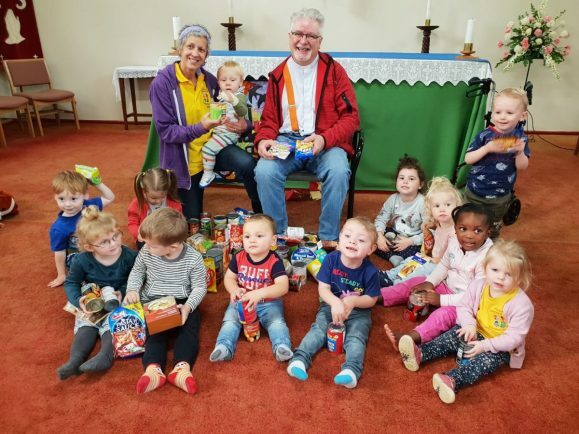 The group, based St Stephen’s Church, is aimed at under fives, has been running for 30 years. Organisers need helpers to set up, clear away and to prepare and serve hot drinks and snacks on Mondays, Tuesdays and Wednesdays. Volunteers help set up at 9am, the session runs from 10am to midday and hot drinks are served at 11am. The play group receives no funding from the local education authority and is purely run for the enjoyment of the children, parents and carers. It holds a variety of activities, including its recent week-long Harvest Festival celebrations. The children acted out the Enormous Turnip story, using visual clues and props and learnt songs, such as The Dingle Dangle Scarecrow and Sleeping Bunnies. During the week the children donated items of food to the local foodbank. Anyone wanting to volunteer for the playgroup should call 07859 010866.